Ask Sarah Moyle what she does and she’ll tell you she’s a visual practitioner or a visual storyteller. The latter is a name she came up with herself a couple of years ago, but it explains what a visual practitioner actually does, which is convey important information through the use of graphics. Moyle’s favorite way to do that is by using whiteboard animations that explain complex and hard to convey concepts as though it were a story. An explanation of what an visual storyteller does. At a technical company like Intel, the need for someone who can break down complex and hard to elucidate topics, like cloud computing or open source, into a four-minute video is clear. While there are educational programs and material to aid staff in learning about key products and technologies, there’s a need for something more manageable; something that would offer snack-sized pieces of knowledge. Sarah came to Intel as a HR generalist before moving to the UX (user experience) group, and she saw the gap in its educational offerings as an opportunity for her to use her creativity and passion for drawing as an educational tool for her fellow Intel employees. “Nobody was really explaining for employees in bite-sized chunks some of the things that might be interesting,” she says. Sarah estimates 25 percent of her job is drawing but 100 percent of the work she does at Intel is centered on the visual arts and designing other visual elements, like infographics, that help tell stories. Right now, she’s working on graphics for Intel’s diversity initiative. That’s what makes the whiteboard, specifically, so effective. In this digital age, analog is the change of scenery the tired brain seems to crave. Especially at Intel, where the focus is so often on innovation and finding a way to digitize or enhance existing processes. 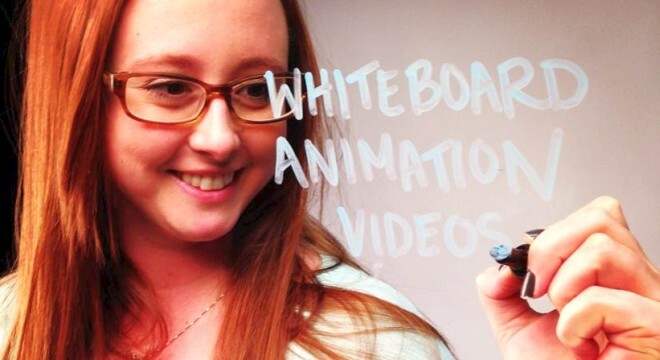 In the beginning, Moyle used a Flip camera and a whiteboard at the Intel offices to make her videos. She now produces the videos at home, in her own studio, using an HD camera mounted on a tripod. A prepared script is broken down frame-by-frame and hand drawn onto her whiteboard. The audio is recorded separately and the track is laid on top of the video. After that, the speed of the drawing is altered to match the pace of the audio. This is a lengthy process; a minute of video can take an hour to produce. “Everything is so digital these days that it’s nice to bring a little bit of analog in,” says Moyle. Moyle’s completed over forty videos across numerous different departments, including the HR and software groups. Her videos appear to last the test of time too; people still comment to Moyle on the first video she made in 2012. Sarah’s job is not just about creating fun and memorable videos, though. It’s also about distilling vast amounts of information down to most important points. During live events, Sarah will work on a large board to make sure the key points of the presentation don’t get lost in the shuffle of information – all of it drawn live to complement a speaker in front of a live audience. Not only does the board work as a visual summary of what was talked about during the session, but it’s also a visual reiteration of important information that the audience might find easier to retain.